E-cigarettes are a relatively new technology, and many users are unsure of exactly how an e-cig works. You might have no idea what a cartomizer is, what you would do with e-liquid or even how the e-cigarette makes vapor in the first place. Finding out the answers to the basic questions regarding e-cigs gives you an idea of how the technology works, why it has a reputation of being so safe and why you’re allowed to use them in most non-smoking areas. Welcome to the world of vaping. E-cigarettes have three important components, the battery, the atomizer and the cartridge. The battery is usually lithium ion, and its main role is to drive the atomizer, which is essentially a small heater. The atomizer, when activated, heats the liquid contained within the cartridge to transform it into a vapor, which is then inhaled by the user. Batteries can either be activated manually (by holding down a button) or automatically (when you inhale from the e-cig). Most e-cigs on the market today have a two-piece construction, which basically means that the atomizer and cartridge are contained within one unit, sometimes known as the cartomizer. One of the most commonly cited reasons that electronic cigarettes could be harmful is that “nobody knows what’s inside them.” This is completely untrue, because whilst the specific ingredients may differ (depending on the flavor of the liquid), they contain propylene or vegetable glycol, water, FDA-approved food flavorings and pharmaceutical-grade nicotine. Reports have also detected trace amounts of tobacco-specific nitrosamines, but these are in exponentially (up to 1,400 times) smaller quantities than you’d find in a tobacco cigarette. The food flavorings are used to add some variety to the taste of the cartridges. Cartridges are usually sold pre-filled with a disposable atomizer, but you can also buy empty cartridges and e-liquid (the nicotine solution) to fill them up with yourself. You can use electronic cigarettes in most smoking areas because the process of turning the e-liquid into vapor is not the same as when tobacco is burned. Smoke requires combustion – or burning – in order to be produced. When a liquid is heated and turns into a gas, it’s vaporized, and therefore made into vapor, not smoke. In the same way as boiling water doesn’t produce smoke, neither do e-cigarettes. This means you can use them in most non smoking areas, and it also means that they don't pose a risk to bystanders. The main thing given off is water vapor, propylene glycol and vegetable glycerin, with tiny, trace amounts of the other ingredients – far too little to cause any harm. Although research is still ongoing, it’s safe to say that e-cigs are much safer than smoking tobacco. The reasons for this are simple. There are over 5,000 chemicals present in cigarette smoke, but only a handful in e-cigarette vapor. E-cigarettes don’t contain tar, carbon monoxide or the army of carcinogens you’ll find in a tobacco cigarette. It’s important to note that more studies need to be conducted on the long-term effects, but the researched to-date has largely confirmed the logical conclusion that they are safe, especially when compared to tobacco cigarettes. 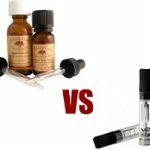 Refillable Electronic Cigarettes – Pros And Cons?